This entry was posted in Art, Daily Post, England, Nature, Photography, Uncategorized, Weekly Photo Challenge and tagged Aimwell CreativeWorks, Autumn, Daily Prompt, Dorothy Chiotti, Light and shadow, litter, Photography, postaday, water, Weekly Photo Challenge. Bookmark the permalink. 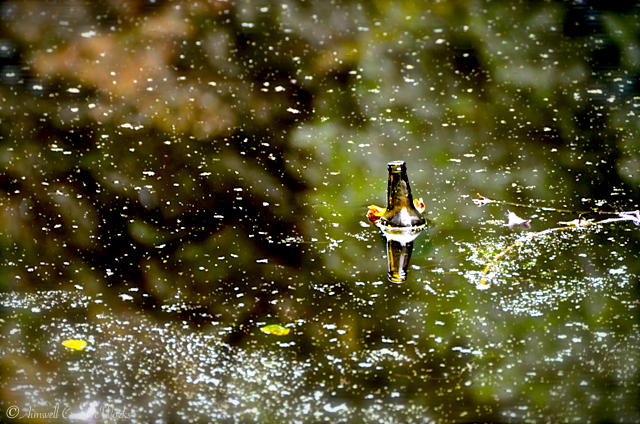 IS THIS BOTTLE HALF SWIMMING OR HALF DROWNING ? I SAY THE BOTTLE IS MERELY FLOATING TODAY AND SOON WILL GET OUT OF THE WATER AND WALK AWAY HAVING ENJOYED ANOTHER LOVELY INDIAN SUMMER DAY HERE IN THE LAZY SOUTH BEFORE THE COLD TEMPERATURES COME AND STAY….